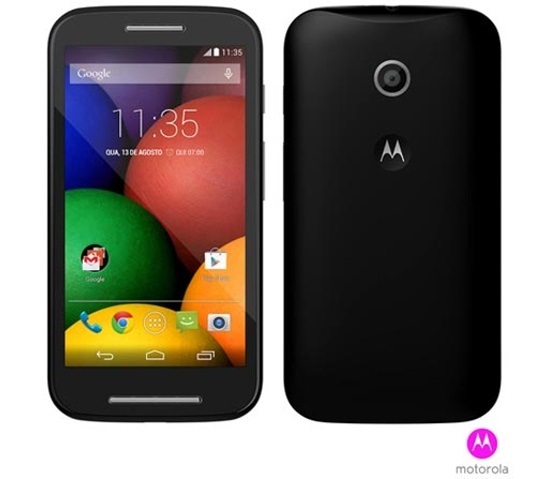 Motorola was teasing Moto E for the last couple of months with hinting very cheap price. And they have unwrapped the covers of Moto E today in India. It will be priced 6,999 rupees in India, that’s equivalent to $117. The phone will be also goes to sale in UK, Brazil, Mexico, Spain and Canada from today. The phone is built around a 4.3” scratch resistant display with Gorilla Glass 3 layer on top. It is of qHD resolution, resulting in a pixel density of 256 ppi. Under the hood of the Moto E operates a 1.2GHz dual-core processor that runs Android 4.4.2 KitKat. The company promises timely updates to future versions of Android, which is nice to hear for a phone of this budget nature. Moto E has 1GB of RAM and 4GB of internal memory, of which just 2.21GB is available. Thankfully, it is expandable with up to 32GB microSD card. At the back, there’s a 5MP camera, while under the back cover resides a 1,980mAh battery. Motorola says it’s capable of lasting through a whole day of constant usage. Motorola says it has built the phone to last and as a result it is resistant to water splashes. On the connectivity side, you’re covered with 3G, Wi-Fi 802.11n, Bluetooth, GPS and FM Radio. There’s a dual SIM variant of the phone (GSM + GSM). The smartphone measures 124.8 x 64.8 x 12.3mm and weighs 140g.